The government on Saturday said there was no reason for two million plus Indian workforce in Saudi Arabia to be "paranoid" on account of a new labour law, 'Nitaqat' and asserted there was "ongoing" discussion with the Saudi authorities in the matter. They also noted that there was a "slight increase" in the number of Indians returning after the authorities in that country started strict implementation of law against illegal migrants. "There is ongoing dialogue with Saudi government on this. Our Ambassador has met the Governor of Riyadh, Governor of Easter province, where the largest number of Indians are there, and Governor of Madina," official spokesperson in the External Affairs Ministry Syed Akbaruddin said, adding the exercise was to see the "human impact" of the law. He also said the mission has put representatives in various trilateral cities of Dammam, including Dhahran, to help Indians, who don't have travel documents, to return. "We have not seen any increase of the significant number of people coming out because of Nitaqat. Yes, we have seen a slight increase in numbers of those coming back because of irregular appointments or irregular working in various places," he said. Giving the assessment of the situation, A R Ghanashyam, Joint Secretary in Gulf & Haj division, said "there is nothing to be paranoid about. Definitely, we should be concerned but not paranoid." Overseas Indian Affairs Minister Vayalar Ravi is also expected to visit Saudi Arbia to convey India's apprehension about possible job losses to Indians due to the new labour law that seeks to reserve 10 per cent jobs for locals. Akbaruddin also noted that the Saudi Minister for Labour, who was India's Saudi interlocutor, was out of that country and will only return after April 15. The Nitaqat law makes it mandatory for local companies to hire one Saudi national for every 10 migrant workers. There has been widespread perception that the new policy will lead to denial of job opportunities for a large number of Indians working there. The Saudi government was implementing the Nitaqat law to cut unemployment in the country. The officials also noted that the 2 million plus strong Indian community in Saudi Arabia is the largest expatriate community in the Kingdom and is the ‘most preferred community’ due to their expertise, sense of discipline, law abiding and peace-loving nature. Akbaruddin also pointed out that the community has seen a drastic increase from 400 thousand in 1988 to about 2.45 million currently in its population. According to the MEA, Indo-Saudi economic relations have shown remarkable growth with bilateral trade registering three-fold increase in the last five years. 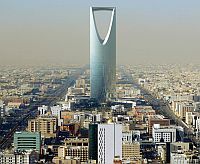 "Saudi Arabia is the 4th largest trade partner of India and bilateral trade was $36 billion in 2011-12. The import of crude oil by India forms a major component of bilateral trade with Saudi Arabia being India’s largest supplier of crude oil, accounting for almost one-fifth of its needs," the ministry said. DMK pushing Sri Lanka deeper into the hands of China?